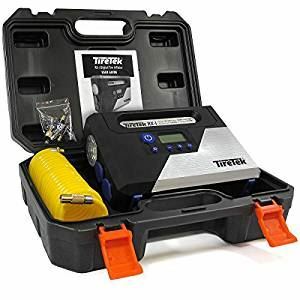 What tyre inflators can I buy from Amazon? Keeping your tyre pressures up to scratch is good news for your tyres and your wallet, but queuing for the air line at the garage is a pain as are the grubby hands that come with it. Save yourself some time and hassle with your own tyre inflator - here’s nine of the best from Amazon. 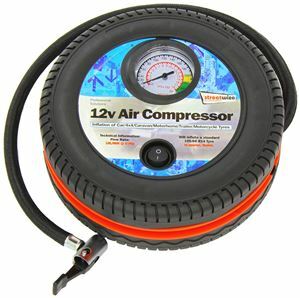 Can often be found on for around £11.00 (down from a hardly pricey £17.64) this Streetwize air compressor is one of the cheapest on the market. Taking a 12V supply from your car via a 2.8m cable it has an analogue gauge reading PSI or BAR and includes three adaptors to suit inflatables as well as tyres. It may not be packed with features but is a good low-price. 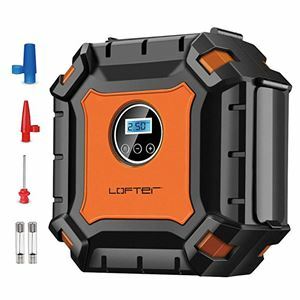 This tyre inflator from Lofter looks ready to inflate a Zeppelin thanks to its tough design and bold black and orange colour scheme, but it has more than good looks going for it. A 3m power cable plugs into your 12V outlet and it dishes out enough air to inflate a flat tyre to 40PSI in less than 5 minutes. The digital display means you can set it to the right pressure and wait for the automatic shut-off, while a switchable LED light means darkness presents no problem. Add in three adaptors and a display that operates in five different pressure units and you’ve got all the bases covered. 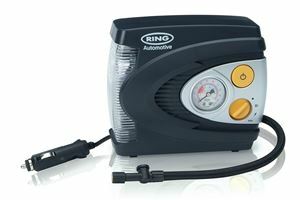 A favourite tyre inflator here at Honest John, the Ring RAC620 keeps things nice, simple and effective. Another plug-and-play device, the Ring RAC620 takes a 12V feed to power the compressor with an analogue dial displaying in PSI, BAR and kg/cm2. Also included is an LED light with red and white flashing modes to attract attention in case of emergency with an adaptor set to inflate toys and bikes. For a few pounds more you can have the RAC600 version with a digital readout too. Traditionalists will love this old-school foot pump from Heyner, which looks tough enough to take on any kind of inflation duties. Built from steel and with a twin-chamber design, it is capable of inflating up to 140PSI which is ideal for high-pressure tyres on trailers and caravans. 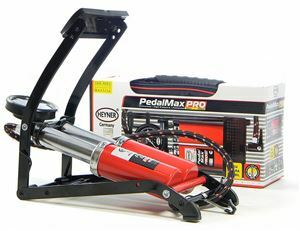 The Heyner PedalMax Pro comes in its own carry bag and weighing in at 2.2kg it should be tough enough to last a lifetime. Covering all the bases at a reasonable price, the Mbuynow Tyre Inflator is ready for just about anything. 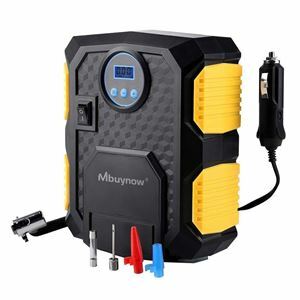 One of the more compact offerings available via Amazon, it still offers a 3-metre power cable into your 12V socket and has enough power to dish out 27 litres a minute up to 100PSI of pressure. The backlit digital display means accurate pressures are easy to achieve and a trio of adaptors gives you the option to blow up a variety of inflatables. 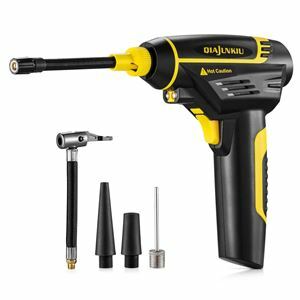 This offering may be one of the more expensive options in this list but your £40+ does get you something unique in that it is one of the few cordless digital inflators available at any price. The lithium-ion battery charges in three hours and maintains enough puff to inflate four car tyres from flat, which should be enough for the most disastrous of journeys. It also includes bright LEDs for dark conditions, a digital display for accuracy and a comprehensive range of accessories including adaptors, gloves and a storage bag. An ideal choice if space is at a premium, the AirMan does a good job of disguising itself as a pair of binoculars whilst dishing out as much air and light as you could possibly need. The typical 12V connector is backed up with a DIN connector designed for motorcycles, while at the other end a brass screw connector means the air line will stay fimrly put during inflation. Best of all at just 800g in weight and only 14cm tall it can be stashed in the smallest of spaces. 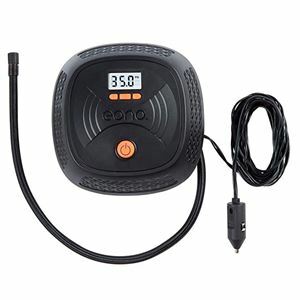 Available in a variety of guises, this version of the EONO Essentials tyre inflator range is one of the cheapest on the market to provide a digital readout for accuracy. 50cm of hose and 3m of power cable makes it easy to reach the tyre and the automatic operation means you can set the required pressure and leave it to work. The three adaptors and power cable stow on the back of the unit too, keeping it compact and easy to store. For the dedicated tyre inflation professional - or at least those who want the proper kit - this offering from TireTek is everything you could want. 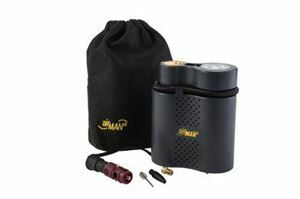 Pushing out a hefty 30 litres of air a minute, it has a 3.5m power cord but adds an additional 12V outlet and two USB sockets so you can inflate and power other devices. The 3.5m air line can be doubled up with a 3.5m extension to reach further, while the digital operation and four included adaptors mean the TireTek is equipped for every eventuality. How can I get my tyre repaired? How can I check my tyre pressures?